One of my favorite Motor Parkway images is this 1909 colored postcard of a race car practicing on "Dead Man's Curve" for the 1908 Vanderbilt Cup Race. For years,most LIMPers and I believed the postcard depicted the almost 90 degree curve near North Hermann Road. But, I am convinced that the "Deadman's Curve" in this postcard was north of Central Avenue in Bethpage, then called Central Park. Over the next several days, I will document this second "Deadman's Curve". Today, supporting information ia presented based on maps, aerials and surveys. 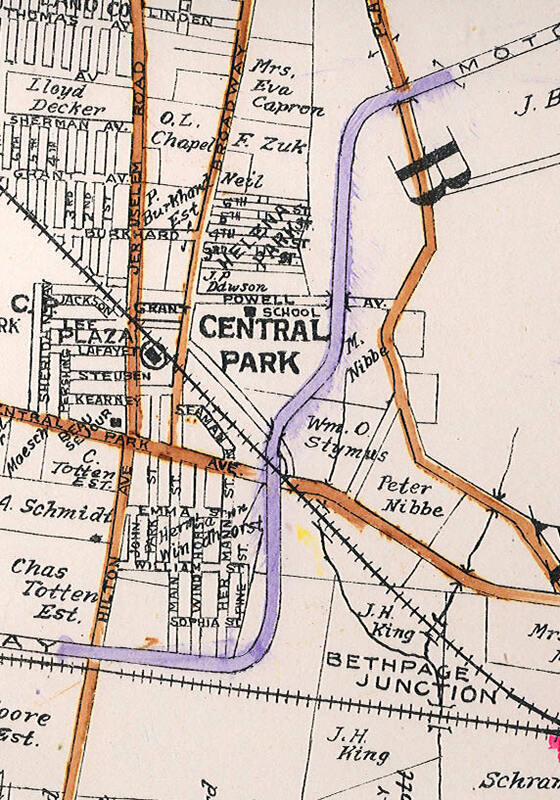 The location of the first "Deadman' Curve" near Bethpage Junction and the second "Deadman's Curve" north of "Central Park Avenue"are shown on this map. 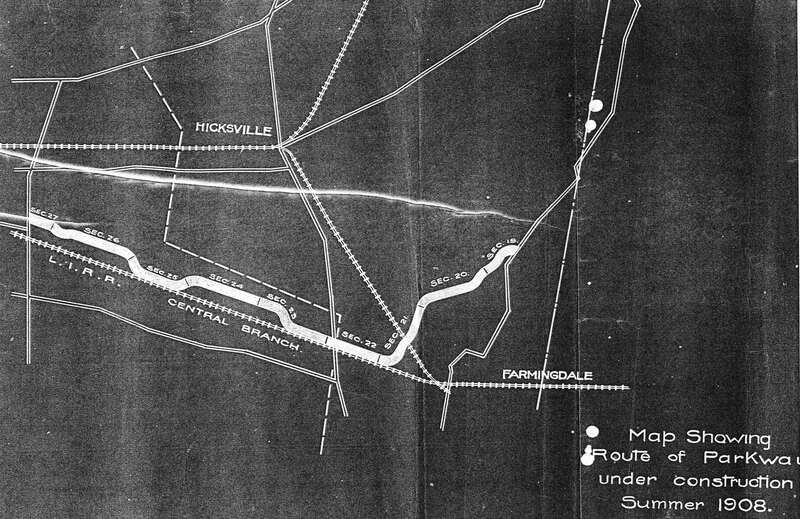 This map shows the 9-mile strip of the Motor Parkway under construction during the summer of 1908. The construction was broken down into "sections" with the two "Deadman Curves" both located in "Section 21". A 1926 aerial shows the Motor Parkway from Wantagh Avenue through Bethpage. A close-up of the 1926 aerial features the Motor Parkway at North Hermann Road "Deadman's Curve" up to the Central Avenue Bridge. This 1926 aerial close-up focuses on the second "Deadman's Curve, north of the Central Avenue/LIRR Bridge up to the Nibbe Farmway Bridge.Note the Central Avenue/LIRR Motor Parkway Bridge can clearly be seen. A rectacular outline also appears at the beginning of the curve. Is this the building seen in the above postcard? These 1950 aerials also show the relative locations of the two Motor Parkway "Deadman Curves" in Bethpage. The layout of the Motor Parkway at the second "Deadman's Curve" is shown in this exclusive 1907 survey map. 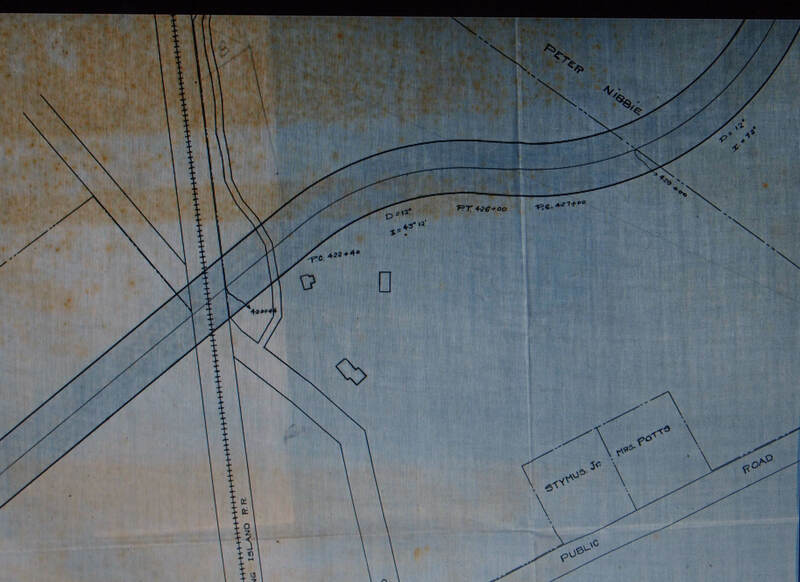 Note the survey indicates the positions of existing buildings.The land at the second "Deadman's Curve" was purchased from the Stymus family adjoining the Peter Nibbe property. Tomorrow, Part II of the Bethpage Challenge will feature photos of the Central Avenue/LIRR Motor Parkway Bridge including; several never before published images of the bridge under construction courtesy of the Garden City Archives.